While pivot point trading strategy is commonly used, there are risks involved nonetheless. These simple ticks can help you to reduce the likelihood of a trade going against you and thus increase your trade probability. There are many pivot point trading strategies which combines either price action or technical indicators. However, in reality trading with pivot points can be a bit risky as prices tend to respect the pivot levels only some of the times. No matter how well you combine the technical indicators, pivot point trading can be a bit risky. 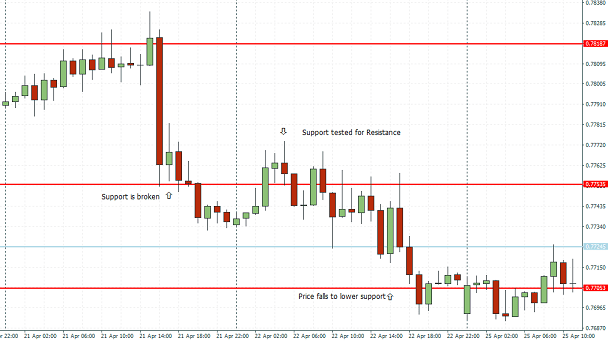 However, this simple trick can help you to identify potential reversal levels and trade more effectively. The pivot reversal method is based on the simple rule that broken support is often tested for resistance and vice versa. Using the pivot reversal method, the goal is to simply look to the left and understand how prices behaved at these levels in the past, after all pivot points are nothing but support and resistance levels. The first chart below shows the pivot levels. Prices initially broke down this support level but then quickly rallied back. However, there was no convincing close at this pivot level, which now turns to resistance. The following price action quickly results in prices falling lower and testing the lower pivot level. Another effective way to trade chart patterns is to combine them with pivot points and the price action. The next example shows a rising wedge pattern. A short position is taken following a spinning top pattern formed near the daily resistance level. Note that this was previously a support level and this marks a retest of the broken support for resistance for the first time. The bias is taken to the downside as we expect price to fall to the next support level which shows a strong confluence with the weekly and daily pivot levels. In the above set up, we can exit the short positions if price closes back above the 0.766 resistance and breaks above the rising wedge pattern. When you have pivot levels from two different time frames sitting at a close level, you can be sure that the price action off this level can be very strong. The next chart below shows a confluence of the monthly and daily pivot levels near 41.07 and 40.99. Notice how this support/resistance level led to a consolidation and prices broke out higher, rallying to the next main pivot point with little pullbacks. In conclusion, pivot points can be a great way to trade and can be combined with any existing strategies. Making of multiple time frame pivot points such as Daily, Weekly, Monthly on lower time frames such as H1 can help traders to find high probability trading opportunities either to scalp the intraday markets or to make use of these methods to time their entries when building positions on a longer term time frame. NextWhy was the yen volatile at April 2016 BoJ meeting?